The article entitled "Dark Play of Serious Games: Effectiveness and Features (G4HE2018)" was coauthored by Kiki Buijs-Spanjers, MSc, Harianne Hegge, MD, Debbie Jaarsma, Ph.D., and Sophia de Rooij, MD, Ph.D., University Medical Center Groningen, University of Groningen (The Netherlands); Fokie Cnossen, Ph.D., University of Groningen; and Evert Hoogendoorn, IJsfontein (Amsterdam, The Netherlands). "Dark play is not ordinarily investigated in Games for Health Journal, yet it may provide a mechanism for enhancing effectiveness. Buijs-Spanjers and her team tested dark play in the context of a medical education game. 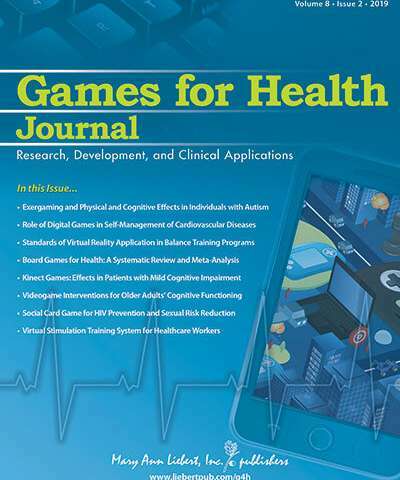 Their findings should be of interest to diverse game designers," says Tom Baranowski, Ph.D., Editor-in-Chief of Games for Health Journal, from USDA/ARS Children's Nutrition Research Center, and Department of Pediatrics, Baylor College of Medicine, Houston, TX.